When we first published a comparison of this current debacle 12 days from the high, we ran the headline “Worst Crash This Century”. We received a few nasty replies from brokerage houses claiming that we were distorting the facts because there had been other declines of a greater percentage within 12 days. While there were a few instances involving brief sharp drops due to news events, none of these previous sharp declines had taken place following a historical major high. Unfortunately, the story has not changed. As we now have completed 34-week days from the major high on July 20th, indeed this decline remains the worst in modern times. The Great Crash of 1929 had produced a percentage drop of only 18% (386.1-314.6) by day 34 (excluding Saturdays). So far, the Crash of 1998 for the first 34 days has posted percentage declines of 21% in the S&P500 futures (1199-936), 25% in German DAX futures (6257-4645), 20% in the CAC40 futures (4415-3529) and 19% in the London FT100 futures (6236-5030). It is also important to note that the US and European share markets have been the major focus of capital concentration for this current 8.6-year wave on our Princeton Economic Confidence Model, which began 1994.25, peak 1998.55 and ends 2002.85. The previous 8.6-year wave (1985.65-1989.95-1994.25) marked a capital concentration in Japan thanks largely to the manipulations that began with the Plaza Accord in September 1985 with the formation of the G5 (now G7). Due to the fact that governments thought they could lower the value of the dollar by 40% to reduce the trade deficit with Japan without causing any disruption in other sectors, the capital flows trends suggest that this was one of the worst mistakes made in modern times. The G5 not only set the tone for the Crash of 1987, but by trying to artificially reduce the value of the dollar against the underlying economic conditions, they induced capital investment from Japan to repatriate this causing capital to concentrate within the Japanese economy. By lowering the value of the dollar by 40%, G5 also created foreign exchange losses on overseas investments for Japanese causing them to withdraw from the US marketplace in effect pushing the next domino over – US real estate and the resulting S&L Crisis. Global capital flows were this enticed by the rise in the yen and Japanese assets. Therefore, when the previous 8.6-year wave reached its peak at the end of December 1989 (1989.95), the bubble finally burst in Japan. As capital rushed outward from Japan, it began to look around for another opportunity. Capital then discovered South East Asia as well as Latin America. As the capital flows then shifted, the emerging markets were not prepared for the onslaught of capital and their economies were eventually pushed into a bubble top that burst with the Mexican debacle in 1994. 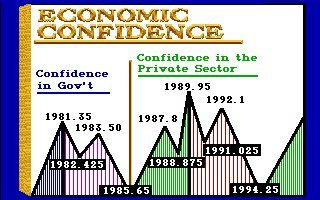 As capital turned once again, the primary focus became the US market as the S&P500 bottomed precisely on April 4th, 1994 with the beginning of this current Princeton Economic Confidence wave. With the dramatic collapse of Russia in 1989, to a large extent, a fair amount of capital was also enticed into seeking bargains in Russia thanks to the IMF. The Mexican bailout headed by the IMF and the US Treasury gained all the propaganda necessary to raise the prestige of the IMF. In fact, the Mexican bailout was merely a bate-and-switch game. When things died down, Mexico merely reissued its debt in the Euro market taking those funds and repaying the US Treasury. In reality, nothing really happened other than they used their Visa to payoff Master Card. The press failed to pick up on this slight of hand and the IMF walked away with an apparent success setting the tone for our current debacle in Russia. It is said to say, but Russia is going to collapse. The Yeltsin government, what’s left of it, will either fall into chaos or be overthrown by a military coup. There is no infrastructure to see the nation through and the money that has been poured into Russia by a foolish crowd of Western investors has done more for funding the Russia Mafia that has now spread to all major cities worldwide than they ever did for economic reform. We now face losses that are staggering and threaten to spread throughout Eastern Europe in a brand new contagion pushing each state over the brink let a shiny set of black enameled dominos. This crisis is Russia is far more serious than mere trade. The losses taken by banks and hedge funds alike are now causing capital withdrawals throughout all emerging markets. This means that the Russian default will spill over into Latin America within a matter of months and may even seriously impact the Euro next year. While we had hoped that the first leg down for the US share market would find support at the 23% by October, we fear that the worst case scenario is now in full motion. Given the fact that the S&P500 has already fallen faster in percentage terms than 1929 or 1987, we are most likely going to see a test of the 844 level within a matter of days or weeks. A drop to the 844 level represents a decline of 29%. It should be pointed out that the decline within the first 2 months in 1987 was 40% and during 1929 it was a staggering 49%. A 40% decline in the S&P500 futures would bring us down to the 719 level whereas a 49% drop equates to 612. Our Monthly Bearish Reversals are 844.00, 757.00 and 610.20. In the case of 1929, the Dow Jones Industrials fell within two-months to test the third Monthly Bearish 205.1 reaching 195.4 intraday. During 1987, the Dow also tested the third Monthly Bearish of 1712.5 reaching 1616.2 intraday. 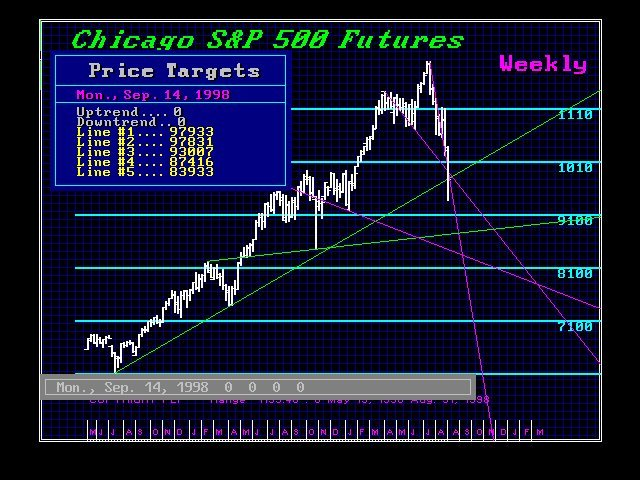 Basis the S&P500 futures, the 1987 crash made it all the way to the 4th Monthly Bearish Reversal at 180.30 reaching 181.00 intraday. This certainly warns that a penetration of 844 means that we could drop to at least the 757 area and we may even reach 610.20 before the first major low has been established. Timing models clearly warn that we must be extremely careful. Any new low next week means that this market is likely to simply collapse falling into Monday September 14th before any real temporary low materializes. The same is true for the European markets. We must also consider the problems of Bill Clinton and the likelihood that a widespread demand for his resignation is likely to emerge following the Star report delivery to Congress, which might be as soon as September 8th or 9th. We are also facing the collapse of the Kohl government in Germany in a few short weeks not to mention a meltdown in Latin America and a possible final collapse in Russia. On top of this, you have the Japanese still trying to talk the dollar down, which makes the politicians cheerful that their currency is rising, but at the same time places the Nikkei at risk of a major collapse due to expanded asset deflation in Japan. The Japanese politicians are likely to cause real serious damage to their own economy. Our model currently shows, that should the dollar break the 130 level against the yen, the Nikkei could also begin a collapse. A break below 11,500 on the Nikkei, and there is little hope that a full-blown banking crisis will emerge taking this index down to 9700. If the Japanese government continues to push for a stronger yen, then the Nikkei might fall to our next Quarterly Bearish Reversal at 8420. Certainly, a year-end closing BELOW 12,882 in the cash Nikkei and we WILL see a break below 10,000 next year. At this point, we must come to grips with the fact that both the US and European share markets are likely to see significantly lower prices ahead. Despite brokerage house forecasts that new highs will be seen by year-end, we must WARN that such analysis is far too biased to be trusted. It brings us NO joy whatsoever to see the world economy meltdown before our eyes. This is NOT a cheerful day. We have NEVER been an advocate of doomsday scenarios. However, this current decline in US and European share markets is DEFINITELY the worst we have seen this century! While there remains a glimmer of hope that the low for this bear market will materialize on the next half-cycle target in 2000, if Russia moves into a military coup we must warn that these market could continue downward into November 6th, 2002 before any change in trend emerges.